Sequential Backus Averaging can be applied prior to the calculation of well log reflectivity coefficients (RFCs). This feature can be helpful when working with highly variable and/or misaligned well logs. Backus averaging is a useful method to upscale / average thin and laminated lithologies of varying properties. When enabled, well logs are upscaled over a sliding window prior to the calculation of reflectivities. In The Rock Physics Handbook, Mavco suggests a wavelength 10x the layer thickness, i.e. for .5m bands of lithology start with a minimum of 5m. Most spikes and very high frequency noise are filtered naturally by the convolution with the wavelet. In the Synthetics window, open the Well tab. 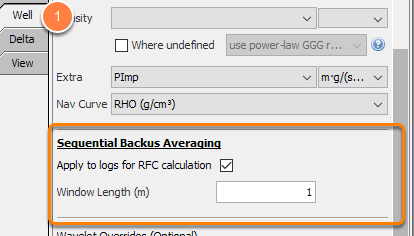 At the Sequential Backus Averaging section, select the Apply to logs for RFC calculation check box. Once you have selected the check box, the Window Length (m) field will be enabled. Type the window length to define the small window in metres used in the sequential Backus averaging.